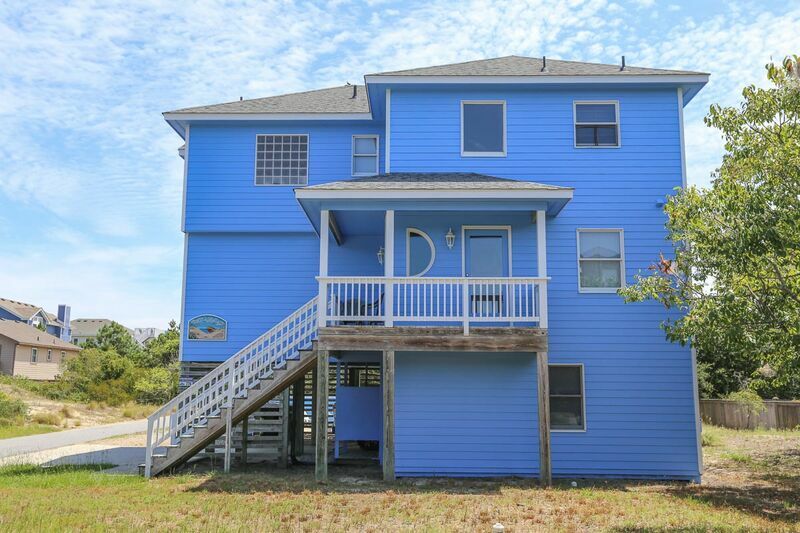 Just five lots back from the beach with ocean views from the upper deck and an easy 175 yard walk to the beach access with no streets to cross. CATVs in every room to provide all with private space. Located between the Harris Teeter shopping center and the Monteray Plaza (Food Lion) and Tim Buck II shopping centers where there is a wealth of shopping, fine and casual dining, movie theaters and services. Private pool and hot tub. 1 bedroom (with Pyramid bunk and Single with CATV). Full bath with access from bedroom and hall. 4 bedrooms (master bedroom with Queen, private bath, deck access and CATV; 1 with Queen with CATV; 1 with Queen with deck and bathroom access with CATV, 1 DVD player; 1 with Twins with CATV). Comfortable living and dining room, well-equipped kitchen, deck access, CA HDTV, DVD player, radio/CD player and ½ bath. 3rd floor master bedroom (with King) is large and comfortable with a large garden tub and separate shower, CA HDTV and deck access.